Given a robust build schedule Jay has made the decision to stop teaching at this time. Please click here to get the latest information and our recommendation for the best luthier to reach out to. 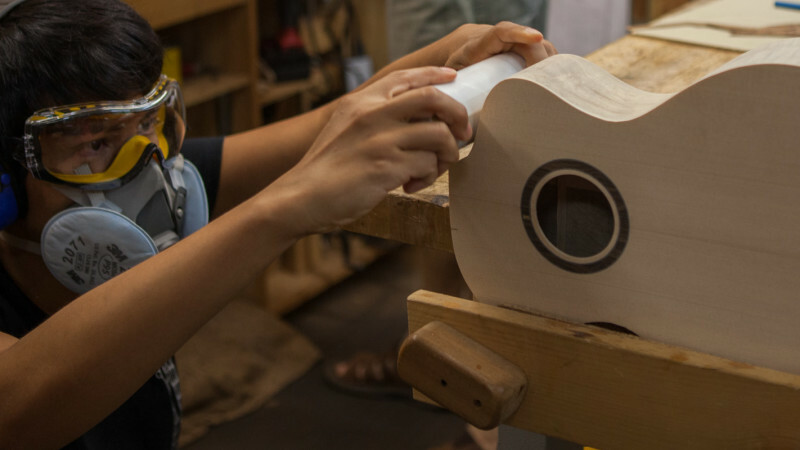 Have you ever dreamed of building your own guitar or ukulele? What a thrill to play an instrument you crafted with your own hands. It’s surprising how many inquiries we receive about acoustic guitar and ukulele building workshops. Some people just want the one-time experience and satisfaction of building their own instrument, while others are looking for a good place to start, with their eyes set on becoming a luthier. Either way, it is Jay’s pleasure to teach the skills that he is so passionate about. He currently teaches a limited number of one-on-one acoustic guitar and ukulele building courses each year. 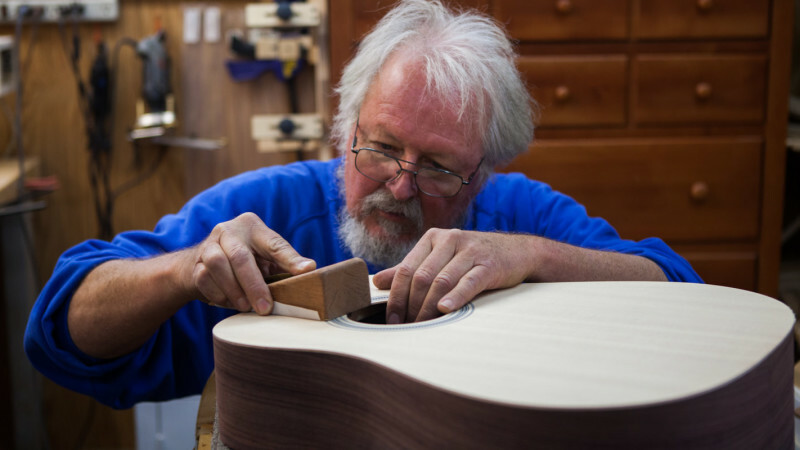 Why take a Guitar Building Workshop or Ukulele Building Workshop with Jay Lichty? While there are other options out there for guitar and ukulele building courses and workshops, very few, if any, provide such a comprehensive experience in such a short time. Because Jay gives you the freedom and creative license to design your dream guitar or ukulele from scratch, you are sure to be happy with the results. The thing we get the highest praise/feedback on regarding the workshops is Jay’s teaching style. He allows ample independence and will challenge you, but when he needs to jump in, he won’t hesitate. He is also a pretty fun guy to spend ten days with. The quality of the instruments crafted during the workshops is extraordinary! It is hard to tell the workshop ukuleles and guitars apart from Jay’s instruments – they are that good! Look to our workshop photo gallery below to fuel your inspiration and to see what we mean. We’ll document your workshop experience via an online photo journal for you to look back on and to give your family an opportunity to follow along from home while you are kicking up dust in the shop. Take a look at some of our Workshop posts for some examples. Location, location! It is a pretty great bonus that our shop is located in the small town of Tryon, NC and sits tucked into the scenic foothills of the North Carolina mountains. You’ll have an opportunity to stay in our comfy guest cottage to boot. It will be a learning vacation you will never forget. Building an instrument to completion in 10 days is an incredibly fulfilling journey. The testimonials from our students say it all! Please note: Jay is currently not offering workshops. Please see our updated post for recommendations. Setting: You will be building right in Jay’s luthier shop. Though you and your project will be the primary focus, when not assisting you, Jay will also be working on his own current projects. Workshop Duration: In ten days, you will complete the building of your instrument. The Project: The guitar of your dreams! Jay builds a wide variety of guitar and ukulele models and you will have an opportunity to build the one that best suits your playing style. You will then choose the guitar tonewood or ukulele tonewood for the back and sides and everything from rosette design to binding to tuners. See Custom Guitar Options or Custom Ukulele Options. The Format: You will build your instrument from start to completion. Jay will do the finishing and then ship it to you once strings are on and it is ready for play. Daily Shop Schedule: Generally time in the shop runs from 9-5 each day, with breaks during the day. Cost: The cost for the guitar or ukulele building workshop is equivalent to the cost of having Jay build that specific instrument for you, plus the cost of shipping, if you live outside our immediate area. You can estimate your instrument cost by using our Price Calculator and selecting the tonewood and other details. To determine potential shipping charges, please contact Jay directly. Accommodations: We have a lovely one bedroom cottage with a full kitchen that you are welcome to rent for $50.00 a night. We can also provide information on other area lodging options. Dates: Jay offers a limited number of these one-on-one opportunities per year. Contact Jay for availability and dates. Travel: We are located in Tryon, NC, in zip code 28782. The closest airports are Asheville, NC (AVL) and Greenville-Spartanburg, SC (GSP) – each is approximately 45 minutes away. Note: The workshop is designed for folks who have some experience working with tools in a shop environment.